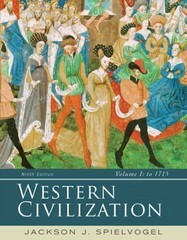 Western Civilization 9 Edition Best-selling WESTERN CIVILIZATION has helped more than one million users learn about the present by exploring the past. Jackson Spielvogel's engaging, chronological narrative weaves the political, economic, social, religious, intellectual, cultural, and military aspects of history into a gripping story that is as memorable as it is instructive. The clear narrative of a single gifted author makes it easy to follow the story of Western civilization.